Leaving games unfinished is a practice I recently developed. God of War? 75% done. Persona 5? It’s forever November as per the in-game calendar. This habit bothers me because I could be missing out on worthwhile adventures—something I was reminded of by The Sword of Ditto’s surprising ending. I’ll admit it was tough seeing The Swords of Ditto all the way to the end. The colourful, cartoon animation-style PC and PS4 adventure game threatened to challenge my patience once I discovered achieving its true ending would require multiple playthroughs. It’s hard enough getting me to finish a game with one ending, and I’ll sometimes quit ones I’m enjoying for no real good reason. But there was something about its charming world, with rude characters living in an apocalyptic age with one town as a last bastion of humanity, that really drew me in. 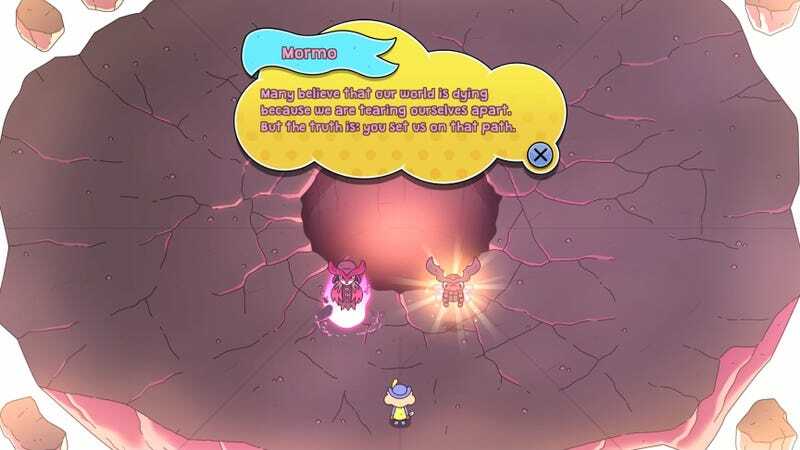 In the typical adventure game spirit, it’s up to the player to dispel the darkness befalling Ditto by facing off against the game’s villain, the evil Mormo. Ditto’s lands, as you would expect, are crawling with monsters. It looks like a fantasy game for the most part. Wizards and zombies, among other creatures, prowl and give chase. But then Ditto introduces you to its dungeons, and there’s more to the world than those first impressions. 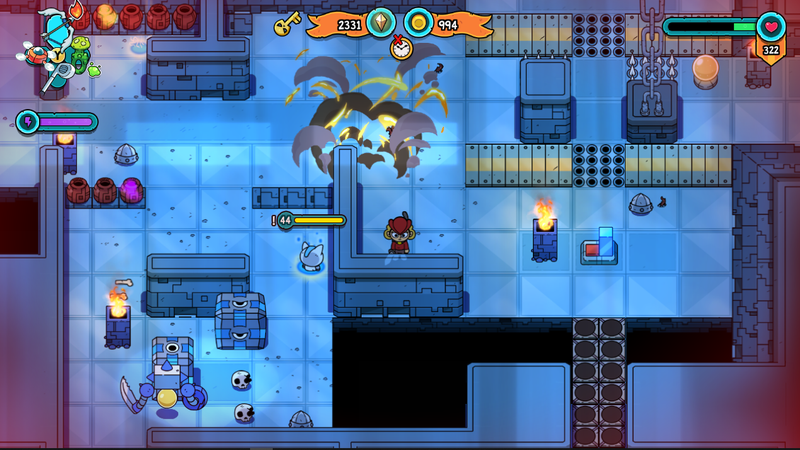 In a nod to The Legend of Zelda series, The Swords of Ditto’s Trial Dungeons are designed to utilise specific items (toys, in this case) to solve its puzzles. The toys themselves are acquired in separate locations called...Toy Dungeons (hey, they are what they are). It’s these dungeons where things get truly interesting. Navigating the Toy Dungeons’ short, death-trapped filled mazes were intriguing—not just for their clever designs—but for the story the game’s visuals and locations told. The Toy dungeons showed an advanced technological world. Enemies seemed to shift in and out of dimensions with a flip of a switch. To add even more intrigue, there are tablets that players find throughout the game. They detail Ditto’s history, a story of war, Ancient Ones, a dying civilisation of Arcadia, and a series of trials inhabitants are made to endure to test their abilities in the dungeons your character explores. This is the world I became invested in—the one that showed a universe blending the traditional fantasy adventure with Dystopian sci-fi elements. It’s as much in its visuals and lore as it is heard in its upbeat, adventurous soundtrack by Niklas Ström. It’s one filled with cheerful sounds of kazoos in one instance, and the brooding vibe of a dark fantasy palace underscored with the futuristic sounds of synth in the next. Despite this curious hook, I still almost gave up after a few rounds. After defeating Mormo, Ditto’s world experiences a peaceful era for 100 years. The cycle repeats with a new hero who awakens to face off against her once more. In subsequent generations, there’s a specific requirement to fulfil in order to break Ditto’s curse. The repetitive nature of the game began to wear on me. It became fight after fight of enemies I became too familiar with. I wondered how many runs I’d have to do. Then I found a few more tablets that encouraged me to continue. They revealed that the despair was brought about by a reclusive and selfish god, Fate, who whimsically left the world to ruin, and went into hiding somewhere in Ditto. And here’s your spoiler—it’s you. I loved the details and clues waiting to be uncovered that had me guessing all the way to the end. The result was a great twist once the puzzle came together which genuinely surprised me. And I adored that the game set it up so that you’re the true antagonist as Fate, and as the player, you are an unwitting participant on an adventure towards your own redemption. Ditto, as it turns out, isn’t even real—at least not the iterations players come to know during the course of the game. The “Ancient Civilisation” of Arcadia is not a thing of the past but a present reality where its people are on a path of collapse, and embroiled in a civil war, all thanks to you. There’s even an explanation for why the game forces you to live through multiple cycles of rebirth. Generations don’t actually pass by but Fate is under a spell to make it seem that way. It’s all merely a test to see if you, as the god character, would willingly and selflessly give of yourself to endure hardships, repeatedly, proving that you had achieved empathy and would hopefully work to fix the mess of your creation. I almost failed that meta-test. I liked the people of Ditto well enough but to give my time to replay the game for the eight times I did almost broke me. It’s not that the game didn’t give options for a shortcut to go straight to the battle with Mormo in each new playthrough (which makes it harder) or procedural worlds for a rogue-like run to help keep it fresh. It was mostly about me and my patience. Between a busy summer and autumn of huge life changes and other life obligations, I had to resolve to commit my time. Multiple playthroughs of games is the sort of deterrent that has me hesitant to begin playing Nier: Automata, as an example. Here with The Swords of Ditto that feature was cleverly woven into its narrative. The reveal itself was great enough to warrant the time for me, even if I think that it could have been shorter by maybe one playthrough (it didn’t help I died during some of my runs either). But then, would I have appreciated it as much as I did? The test of endurance and the rewarding pay off at the end? The Swords of Ditto handled this brilliantly, all the while building a deep lore to tell the story of your character’s transgressions. The Swords of Ditto’s ending was personal and bittersweet. Here was this game with a seemingly sunny disposition hiding so much more depth, and I would have missed it. I leave too many games unfinished. Sometimes, you just have to let go—whether that’s due to time issues, a lack of interest, or whatever the case may be. But I’m glad I saw this one through.